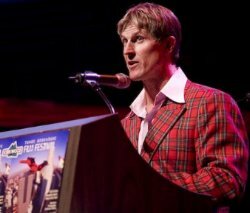 With his hilarious antics and positive attitude on and off the screen, Todd Offenbacher, world-class climber and Lake Tahoe TV host, embraces every day to the fullest and encourages us all to do the same. While he has taught us all not to take ourselves or life too seriously, Todd has made it his passion to remind us why we chose to live in this special place. A body builder dating back to the early 1980’s at Muscle Beach, CA followed up in 1989 when he owned and operated a gym in West Virginia, Todd has always been a strong proponent of health and fitness. 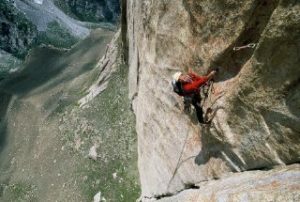 Then in 1990 he caught the climbing bug which sent him out west to Lake Tahoe where he has lived since 1996. As with everything in his life (see Todd’s bio below), Todd charged into the mountaineering scene with gusto and precision. He also fell in love with snow skiing. Tahoe Adventure Film Festival showcases excerpts (approx 10 minutes) of the best adventure films every December in South Lake Tahoe. Due to popular demand and sell out crowds, the festival has outgrown its hometown roots in Lake Tahoe. After the Lake Tahoe premier, Todd takes his entourage and act on the road to Reno and other venues throughout Northern California spreading his gospel about the virtues of Tahoe mountain culture. Todd Offenbacher (pronounced Tod Offenbacher) the second “d” is silent. Fastest kid in 4th grade running the 100yard dash including beating Roberta Roberts. Won the east coast skateboard championships of pool riding under age 14. Vineland New Jersey. Grounded by parents 7th thru 9th grade. Wrestled at United States Navel Academy – summer youth wrestling camp. 1979 – Top sales person at Offenbacher Pool n Patio, Rockville, MD. 1980 – Graduated Wooten High School with GPA of 2.7. Potomac, MD. 1981-1983 -Moved to Muscle Beach, CA and lifted over 5,680,000 lbs. in less than three years! 1985- Created home gym personal training services in Potomac, MD, and Great Fall, VA.
1989 -Partnered with West Virginia friend to build a 22,000 sq. ft. fitness center in Rockville, MD. 1990 – I was introduced to “rock”. I began giving up everything I had chasing it. 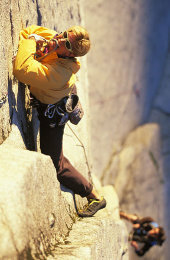 1997 -2001-Traveled on several international rock climbing expeditions. Learned many lessons about aggressive international bacteria. 2002 -Married Tara Bosch Offenbacher. Then added over twenty new decorative pillows to our bed. 2003- Tore my quadriceps off my knee in a ski mishap. Served 5 months time, did another 3 months probation in a leg brace, and another 5 months in a half way status. 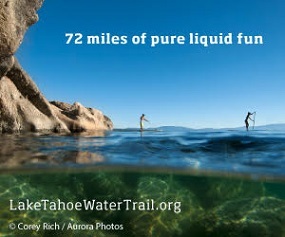 I focused on the positive and created the first Tahoe Adventure Film Festival. 2004-Tested my repaired quad by swinging from ropes on the granite big walls of La Esfinge, 5230 meters in Paron Valley, Peru and realized it works! 2005-Traveled to Italy and Sardinia, eating and drinking, and climbing big walls. 2006-Climbed a new route on Haizi Shan 5860 meters in western China where he ate Chinese food for a month. Traveled to South Africa and discovered incredible rock climbing and culture. 2007- Sweated like the guy in Midnight Express while climbing in Thailand. 2008- Red Pointed over twenty 5.7 sport route, and on sited Hay Stack 5.8 Lovers Leap. Survived my first BASE jump and replaced my old well worn out underwear. 2009-I have been clean-shaven for 4 years. I live with my wife and golden retriever, Bugsy, in South Lake Tahoe, and continue to pursue epic ski lines, rollerblading and new climbing routes with Fred Beckey.